This item contains the resignations of Fred Hall and William A. Smith and the oaths of office for John McCuish, Fred Hall, and George Docking. 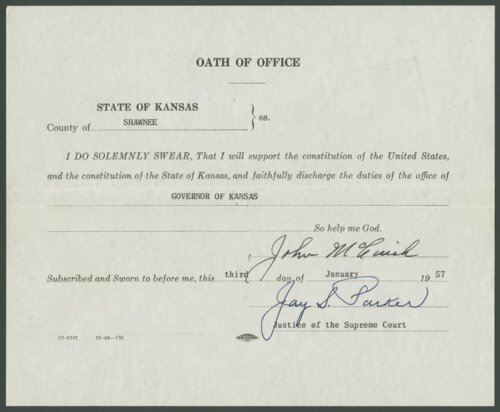 These records are part of what is known as the political "triple play" involving Kansas Governor Hall, Lieutenant Governor John B. McCuish, and William Smith, the Chief Justice of the Kansas Supreme Court. Incumbent Governor Hall was defeated in the 1956 Republican primary by Warren Shaw, who lost in the general election to George Docking. Then Chief Justice Smith resigned from the Supreme Court due to ill health on December 31, Hall quickly resigned as governor on January 3, 1957, and Lieutenant Governor McCuish became governor for the next eleven days. McCuish immediately appointed Hall to the newly vacated Supreme Court seat. While perfectly legal, this sequence of actions was considered by many to be highly unethical. In response to the "triple play," the 1957 Kansas legislature passed a resolution for a constitutional amendment concerning the way judges were appointed. The amendment was passed in the 1958 general election. This item contains the resignations of Fred Hall and William A. Smith and the oaths of office for John McCuish, Fred Hall, and George Docking. These records are part of what is known as the political "triple play" involving Kansas Governor Hall, Lieutenant Governor John B. McCuish, and William Smith, the Chief Justice of the Kansas Supreme Court. Incumbent Governor Hall was defeated in the 1956 Republican primary by Warren Shaw, who lost in the general election to George Docking. Then Chief Justice Smith resigned from the Supreme Court due to ill health on December 31, Hall quickly resigned as governor on January 3, 1957, and Lieutenant Governor McCuish became governor for the next eleven days. McCuish immediately appointed Hall to the newly vacated Supreme Court seat. While perfectly legal, this sequence of actions was considered by many to be highly unethical. In response to the "triple play," the 1957 Kansas legislature passed a resolution for a constitutional amendment concerning the way judges were appointed. The amendment was passed in the 1958 general election. Government and Politics - State Government - Lieutenant Governor - McCuish, John B. People - Notable Kansans - McCuish, John B.